Microsoft recently unveiled the Surface Go, which is being touted as the slimmest, lightest and most affordable Surface tablet yet and it still manages to feature an Intel chip and not one made by Qualcomm, despite Microsoft partnering with the latter to push the Windows 10 on ARM platform. Targeted to the budget-friendly audience that demands better battery life, the Surface Go could have easily been a machine belonging to the ‘Windows 10 on ARM’ category. Here is why Microsoft chose a different route for the tablet. To recap, the Surface Go offers 9 hours of battery life, with LTE support arriving later this year. The battery life is not going to be its key strengths, as several notebooks that can effortlessly provide 10+ hours on a single charge. However, being incorporated with a Snapdragon 835 or a Snapdragon 850 might have provided battery life as a key strength, as the expense of hammered performance (if it used a Snapdragon 835, not the Snapdragon 850), and lack of software support. Intel should admit by now that the market share in the mobile market has largely swept by ARM as they are preferred for their battery life, thermal management, and power efficiency. Even though the latest ARM chips have faster LTE modems and will soon be 5G ready starting 2019, it wouldn’t have made sense to power Surface Go with them. 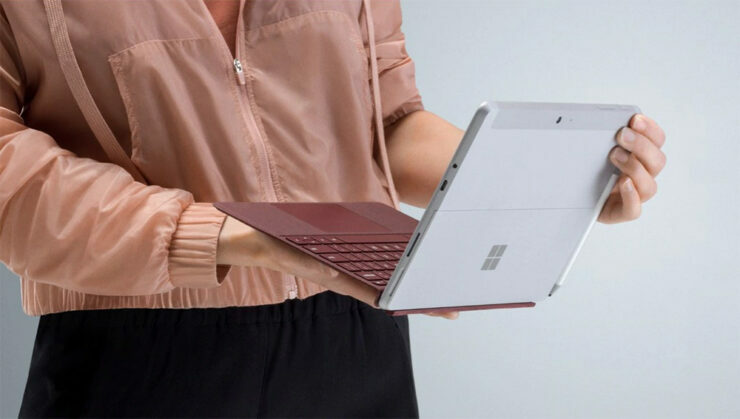 Surface Go is a portable computing device targeted at students and travelers and it competes with Chromebooks and Apple’s iPad lineup by offering better software in return. I believe that Microsoft has an advantage over the two because of Windows 10, making complete sense to integrate an x86 chip in the Surface Go. The device will need lots of support in a lot of cases when it comes attaching a wide array of peripherals. The ARM architecture wouldn’t have been compatible with that and with the x86 architecture being a more open platform, it is really easy to install nearly any OS on an x86-fueled device. Additionally, it is also easier to install hardware drivers and support doesn’t vary according to vendors. In contrast, ARM vendors do not expect drivers, firmware, and software from one to work on another. The release of the Surface Go powered by Intel will also give Microsoft more time to work on Windows 10 on ARM. The first generation of ‘Always Connect PCs’ powered by the Snapdragon 835 were abysmal in terms of performance and battery life, which was expected to be their premise. We do not believe that Microsoft will officially start to offer Surface products with Qualcomm chipsets until the arrival of the Snapdragon 1000, which is said to feature a different model name than the one that has been floating around, and is expected to give Intel’s U-series of processors a tough competition thanks to its rumored 12-watt TDP. What do you think about Microsoft’s decision? Was it the right thing to do? Tell us down in the comments.